At this very moment in history, when so many people and nations around the world are acknowledging the 100th Anniversary of our planet’s hapless stumble into World War I, great powers and their allies are ironically once again provoking new dangers where governments appear to be sleepwalking towards a restoration of old Cold War battles. A barrage of conflicting information is broadcast in the various national and nationalistic media with alternative versions of reality that provoke and stoke new enmities and rivalries across national borders. With the U.S. and Russia in possession of over 15,000 of the world’s 16,400 nuclear weapons, humanity can ill-afford to stand by and permit these conflicting views of history and opposing assessments of the facts on the ground to lead to a 21st Century military confrontation between the great powers and their allies. While sadly acknowledging the trauma suffered by the countries of Eastern Europe from years of Soviet occupation, and understanding their desire for the protection of the NATO military alliance, we the signers of this global call to action also note that the Russian people lost 20 million people during WWII to the Nazi onslaught and are understandably wary of NATO expansion to their borders in a hostile environment. Russia has lost the protection of the 1972 Anti-Ballistic Missile Treaty, which the US abandoned in 2001, and warily observes missile bases metastasizing ever closer to its borders in new NATO member states, while the US rejects repeated Russian efforts for negotiations on a treaty to ban weapons in space, or Russia’s prior application for membership in NATO. 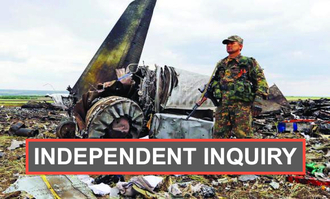 For these reasons, we the peoples, as members of Civil Society, Non-Governmental Organizations, and global citizens, committed to peace and nuclear disarmament, demand that an independent international inquiry be commissioned to review events in Ukraine leading up to the Malaysian jet crash and of the procedures being used to review the catastrophic aftermath. The inquiry should factually determine the cause of the accident and hold responsible parties accountable to the families of the victims and the citizens of the world who fervently desire peace and a peaceful settlement of any existing conflicts. It should include a fair and balanced presentation of what led to the deterioration of U.S. –Russian relations and the new hostile and polarized posture that the U.S. and Russia with their allies find themselves in today. The UN Security Council, with US and Russian agreement, has already passed Resolution 2166 addressing the Malaysian jet crash, demanding accountability, full access to the site and a halt to military activity which has been painfully disregarded at various times since the incident. One of the provisions of SC Res 2166 notes that the Council “[s]upports efforts to establish a full, thorough and independent international investigation into the incident in accordance with international civil aviation guidelines.” Further, the 1909 revised Convention on the Pacific Settlement of International Disputes adopted at the 1899 Hague International Peace Conference has been used successfully to resolve issues between states so that war was avoided in the past. Both Russia and Ukraine are parties to the Convention. Regardless of the forum where the evidence is gathered and fairly evaluated, we the undersigned urge that the facts be known as to how we got to this unfortunate state of affairs on our planet today and what might be the solutions. We urge Russia and Ukraine as well as their allies and partners to engage in diplomacy and negotiations, not war and hostile alienating actions. The world can little afford the trillions of dollars in military spending and trillions and trillions of brain cells wasted on war when our very Earth is under stress and needs the critical attention of our best minds and thinking and the abundance of resources mindlessly diverted to war to be made available for the challenge confronting us to create a livable future for life on earth. It’s important because there is so much misinformation and disinformation in the media that we are careening towards a new cold war with Russia over this.